I’m including this script just so I don’t need to hunt it down in the future… Paul is a very big brain in SQL Server. He worked in product engineering and owned the DBCC command and more. For whatever reason, sometimes this site “hangs” and doesn’t do anything. This site actually sells a pretty printer that you can run locally, in addition to the above web based site. Many of the apps I work with are dynamic query generators with anywhere from 20 to 80 tables in a join. It’s code by a machine, for a machine. An enterprise grade SAS drive is spec’d at 3ms to 8ms response times. Guys at Microsoft will tell you they want 10ms or less for everything. 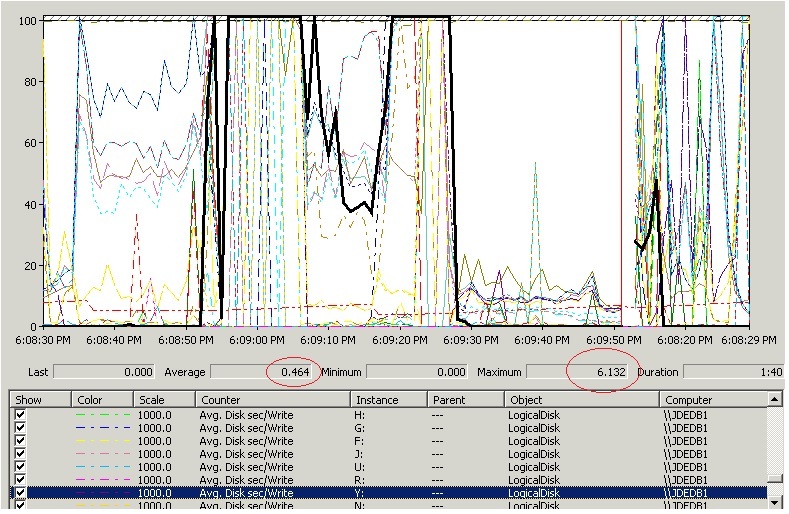 My goal is 10ms for the transaction log (LDF), and 20ms for the data files (MDF/NDF). What happens when your are beyond 10ms on the t-log? The system stops being usable. The curious thing, CPU goes way down because no work is being done. This makes most sysadmins scratch their heads because they don’t realize where the bottleneck is. Here’s and example of 6,132ms (6 seconds) response times on a write operation (really bad). The following is a sample output showing that the Read Latency is 6ms and the Write Latency is 255ms with the Average Latency (R+W) is 145ms. From Jimmy May @ Microsoft. –Weasel Clause: This script is provided “AS IS” with no warranties, and confers no rights. Always trying to figure out “if” and “how much” my indexes are being used. When I apply my custom indexes or missing indexes, I put _fmcb_ in the name of the index. This way, I can run the below query and extract all of them out for a separate build script. Problems happen when you have fragmentation in the t-log. You can find this by running DBCC LOGINFO. This usually happens when autogrow kicks in and the database is set at the defaults… which are very small. 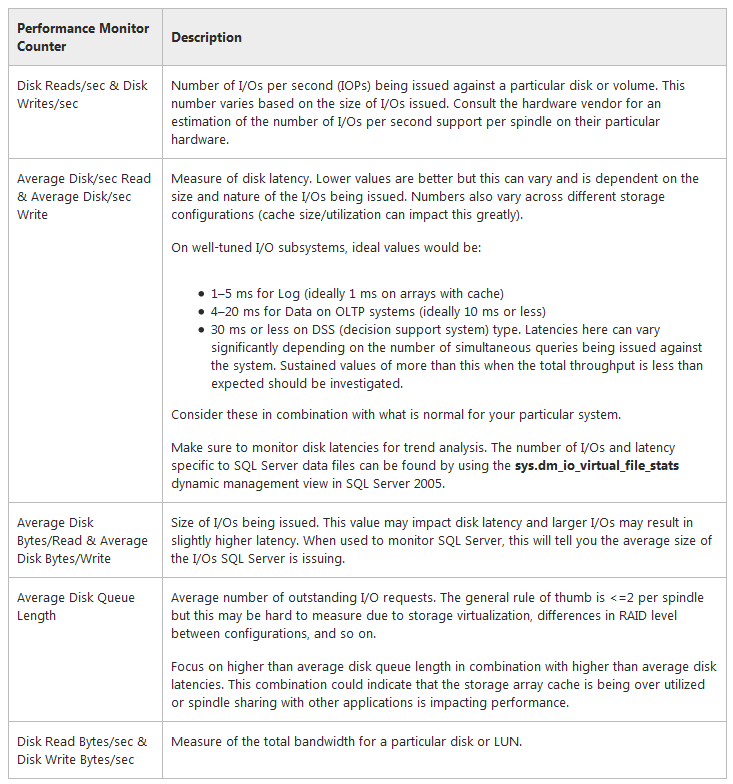 Database x has more than 1000 virtual log files which is excessive. Too many virtual log files can cause long startup and backup times. Consider shrinking the log and using a different growth increment to reduce the number of virtual log files. 1. Wait for an inactive time of day (ideally, it would be best to put the database into single user mode first) and then clear all transaction log activity through a regular transaction log backup. If you’re using the simple recovery model then you don’t need to do a log backup… Instead, just clear the transaction log by running a checkpoint. NOTE: if you don’t know the logical filename of your transaction log use sp_helpfile to list all of your database files.